Mistakes, apologies, arguments, fights, disappointments, and hurting are part of every relationship. No one in the world is perfect because we are human beings and not angels. We make errors, sometimes blunders, and after realizing; we feel sorry about that. For this reason, giving second chances to each other is also normal. Some people might not think alike, but still, everyone looks for a second chance. This article is for the people, who have made their loved ones angry and are looking for a second chance. There are more than 100-second-chance quotes and sayings that will help you in getting one more chance for the relationship. Just select the best for your beloved and send it through a text message, MMS, or via sorry card. I hope all of these sayings and quotes have the ability to melt someone heart. Good Luck! Some mistakes are unintentional and they really need a second chance. Forgiveness and giving chances are the soul of a true relationship. Every relationship needs a second chance. Most of the times second chances work better than the first one. That’s because people learn from their mistakes. Give second chances in a relationship. You might need them too! 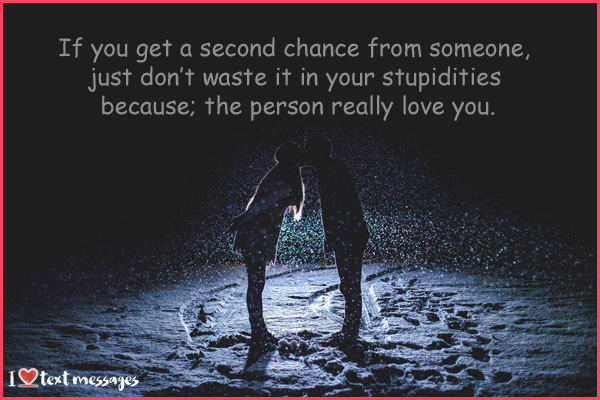 If you get a second chance from someone, just don’t waste it in your stupidities because; the person really love you. Sometimes love deserve a second chance because time wasn’t ready for the first. Starting all over is not bad at all. It helps in providing a chance to make all the things perfectly alright. If you can’t give a second chance in a relationship, then you should never expect to get chances from God. If a relationship is based on true love, everything is worth…give one more try! 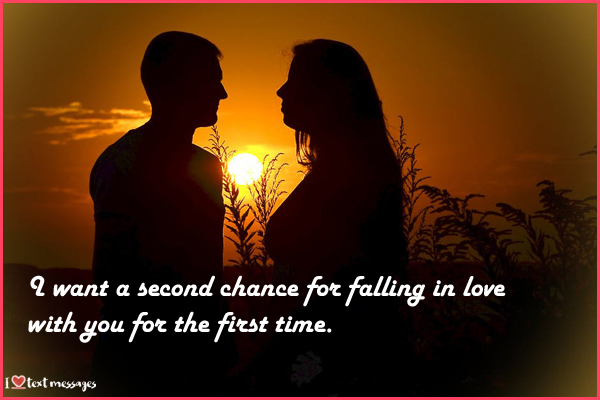 If she is is giving you a second chance, believe me, she is your true love! Giving someone a second chance is not giving a second bullet to shoot…It shows your love and greatness! If he is begging for a second chance, give him. You don’t know when you will need it too. If God always gives me second chances, why shouldn’t I give them to the one I really love? Life is all about forgiveness and second chances. So, forgive others and give them chances. A relationship without chances is the one with no space and no place. If moving on is easy and you don’t care about the loveable memories, no need of second chances. A second chance doesn’t make its sense, if you have not learned from your mistakes. A real relationship is full of mistakes, cute apologies, and second chances. If you really love a person, then don’t hesitate in giving a second chance. Be patient, keep a big heart, and give second chance…If the person fails, you will not have any regrets. Give a second chance. If he would be a real guy, he will not repeat the mistakes. True lovers never waste the second chance. If you give a second chance to somebody, don’t recall the mistake again and again. Respect him and be calm. I, you, and everyone need a second chance. Life gives us so many chances. Why not to share them with your loved ones? If you have the ability to give chances to your siblings, then why not to give them to your boyfriend/girlfriend. 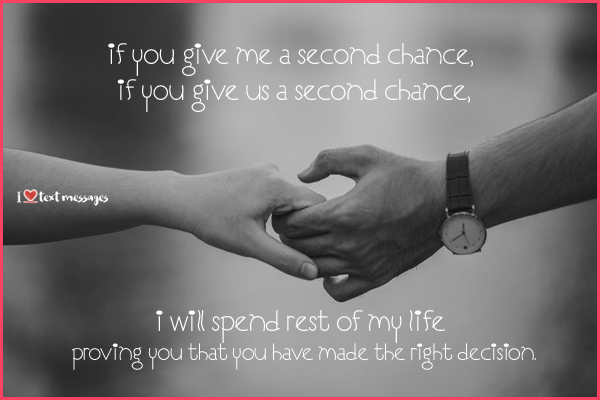 If you will give me a second chance, I will give you second, third, and fourth. If you are ready to give a second chance, don’t implement any restrictions. Just wait and see, how they avail the opportunity. Being a human being, there will always be mistakes and second chances. True love believes in second chances. Your love is a real treasure and I have learned that my attitude with you was wrong. Please forgive me and give a chance to make the things right. Love you forever! You might not be expecting a message from my side. You might not be thinking about me right now. But still, I am continuously thinking about you and regretting myself for all the mess. I am sorry about everything and I just need a second chance. Please forgive me for once and I will never let you down again. I love you! After realizing my mistakes and stupidities, getting a second chance has become a matter of life and death for me. Please give me just one more chance to prove that I have changed now and I am a better person! I regret hearing to others. I regret believing in what did they say about you. Please give me a chance because; I love you more than anything. A second chance is a sign of being noble. A second chance is a symbol of kind-heartedness. I know you are the one and I hope you would think about giving a second chance to our relationship. I was always proud of myself. I always took your love for granted…But now I have realized that I am incomplete without you. Please give me a second chance to prove my truthfulness and love for you. Please…. I am sorry for what went wrong. 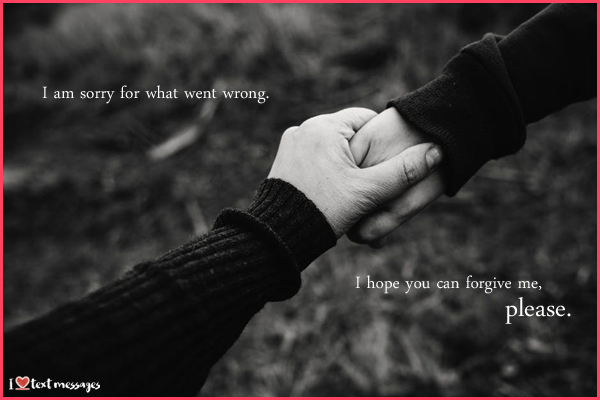 I hope you can forgive me, please. I miss those days when we were together. We eat together…drink from the same glass and spent every moment talking to each other. Just a one mistake changed everything… Can I please get a chance to make things as lovely as before? I regret for making you cry. I am sorry for disappointing you and our perfect relationship. Every second has made me realize that I am nothing without you. Please give me a chance and I will never ever hurt you again. I and you always promised to hear each other and will never break up without giving space. This is the time to fulfill that promise. Things are not the same as they seem to be. Please give me a chance to prove my love for you! Many people don’t deserve second chances, it’s completely a waste of time some would say, but I say if you are willing to look past things it could be the best choice of your life, think about it. We are humans and we make mistakes. I am not a perfect guy, but I promise, I will be a better one. Please give me a second chance and I will be very grateful to you, my love! I hate waiting. But, if waiting is to get a second chance and be in your life again, I would love to have it. Please accept my sincere apologies and just trust me for once more. I will never let you down…Please! Every one learns from mistakes and I am also a human being. I request you to please give me one more chance to show and act according to the lessons I have learnt. I just need a second chance! All I badly need is you…All I am dying for is a second chance…Please give me only one more chance to be the perfect lover of yours’ Please…. I have learnt from my mistakes…Please give me one more chance to prove that… I love you! Second chances are not given to make everything right. They are just for proving that we could do better from the first time. Please give me a more chance for once. All what I did might not allow you to give me a second chance. The mess I created and the way I behave with you might not make you to forgive me. But still, I beg you for a second and the last chance. Please forgive me for the sake of our perfect relationship. I love you! I just want a second chance to clean up my all mistakes. Please, I beg you for it. Sometimes good people make bad choices. It doesn’t mean they are bad, it means they are humans. Same is the case with me. I love you with the bottom of my heart, but foolishness made me to make the worst mistake of my life. I regret that moment and I promise it will never happen again. Just looking forward to a second chance! I know it’s very difficult to be with you again. Still, I pray every day to get a second chance and we will begin from the first day. Love you! No words to apologize…just regrets for making your cry. Can I get a second chance? I promise I will no more bring tears in your eyes. I know, I really messed up things. I am truly sorry for all that. I just wanna make all right and that’s only possible if you could give me a second chance. I love you, my dear. I really do. Life always offers a second chance that is tomorrow. 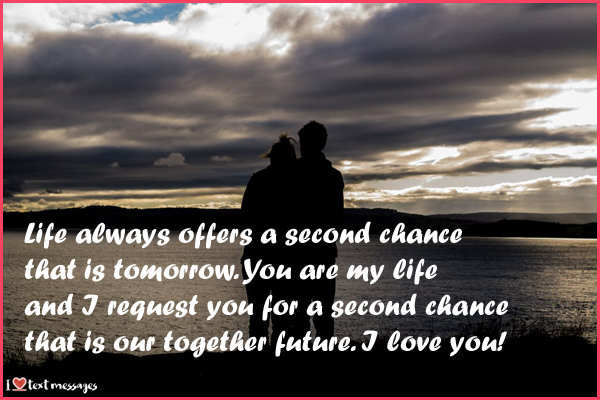 You are my life and I request you for a second chance that is our together future. I love you! I admit that I am not flawless. I admit that I am not an angel. I am just a human being who is extremely embarrassed for letting you down. Please give me a second chance…Please give me a second life because; it is impossible for me to live without you. My relationship with you was stronger than any other. I never thought about these hard times. I never thought about living without you. Still, I am just unable to do anything. Can I please get a second chance? I will never hurt you again. The time without was as lonely as a nightmare. Thank you for accepting my apologies and giving me a second chance. I love you! Please give me back my sunshine. Please give my life back to me. I am sorry for what I did. Please give me a second chance! You are my queen and you will be. You are my life and you will be. You are my world and you will be. I will never drink. I will never let you down. I will never disappoint you and I will never hurt you. Just give me a second chance because; I can’t live without you. You are my wife and no one knew me better than you. You are my life and no one knew how much I love you. It was a mistake and I am continuously admitting it. Please give me a second chance to let you know that I am neither wrong nor it was all planned. My dear wife, I know I’ve disappointed you and hurt you badly. But living a few days without you have made me to admit that I was wrong and you are life. Please let me allow beginning a new phase of life with you. Please give me a second chance to be the best husband for you. Hurting you was the biggest mistake of my life and I am sorry for everything. I beg you for a second chance and I will never disappoint you again. Forgiving and giving a chance is the nature of God. I hope HE would sprinkle some of it on you too. I love you, my sweetheart! I plead for a second chance, let me show you I can do better than I did previously, I am a completely different person now, let me treat you like the queen you are. Let me show you that you deserve the best! My dear wife, I admit that I am the only reason behind all the issues. Please give me one more chance and I will sort out everything for you. Please! My dear wife, all of our loved ones need a second chance. I am not a perfect human being. I have many flaws and I admit that. I just request you for giving me a second chance and I promise, I will be a better person from the past. Please give me a second chance for the sake of those lovely days we had spent together. Please forgive me. Please come back because; there is nothing for me without you. I love you, my wife! The person who forgives is greatest and I’m sure you are the one. My dear wife, please give me a second chance and let me prove my love for you. Please give me a second chance for the sake of our kids. Please give me one more chance for the sake of time we had spent as a family. I will never disappoint you again. Betrayal was neither my intention, nor my aim was letting you down. All what had happened was just because of misunderstanding and yes, due to my foolishness. I request you for a second chance and I promise that it will never happen again. Please, my darling…you know, you are world. In my life, I have never begged for anything. But today, I am begging you for a second chance. Just for more chance to be a part of you. I love you, my wife. I will never hurt you again. Can we begin from the day of our wedding? Can I please get a second chance? I promise there will no more disappointments from my side. You were always behind my success and I took your love for granted. You were always with me in the hard times and I always thought it as your responsibility. I hurt you, let you down, and made you cry. And now I, with tears in my eyes want to request you for a second chance. Please just once more! Please keep yourself at my place and imagine how much I loved you. Imagine how much regret I will be having for disappointing you. If you feel that, please give me a second chance. I will make assurance that you will never cry because of me. I know changing your mind after making such mistake is impossible. But when it comes to love, there is nothing impossible. I hope to get a second chance and you will see a completely different person in me. Please, my dear! Sometimes, second chance is all what someone needs. And yes, I need that badly…just to make things right…just to be in your life forever…Please give me one more chance to prove my love for you… I love you! I want a second chance for falling in love with you for the first time. You are my only hope in the world and I am sorry for hurting you. You are all what I have and I am sorry for letting you down. I was wrong and I promise that it will never happen again. Please give me a second chance. I beg you! Please give more just one more chance for the sake of those lovely days, we spent together. Please forgive me for the sake of those nights we spent together. I love you and I am sorry for everything! I will do whatever you say. I will never demand for a luxurious life. I will never misbehave with you. In just some days, I have realized that you are my only true relationship. Please give me a second chance and allow me to show you have made the right decision. You are my husband and nobody knows me better than you. I am also a human being and the mistake I made was just of trusting someone. I am sorry for everything and I hope I would get a chance because; you have always been the biggest supporter of mine. I know I haven’t been a perfect wife for you, but still, you are my world and I love you more than everything. Can I please get a second chance? I will never let you down anywhere. That’s my promise and God is seeing me making it. All I need is a second chance. All I need is your love. All I need is only you. I promise there will be no more mess ups and I will prove myself worth keeping for you. Please just once! I am really missing you a lot and embarrassed on all my mistakes. I was thinking that all glisters are gold, but I was wrong and you were right about that. Please give me a chance to make the things right…Please give me a chance to begin from first! If you give me a second chance, if you give us a second chance, I will spend rest of my life proving you that you have made the right decision. Disappointing you was not my aim. Hurting your feelings was not my intention. I know I did that and every moment is making me sorry for that. Please give me a second chance to make the things right. You might be thinking I’m with someone right now. You might be wondering why I’m contacting you. That’s because you are my true love and I just want to get a second chance to make things right! Love you, sweetheart! I know I let you down so many times. I know I never care about your feelings. I know I hurt you very badly. But still, you are the one who conquered my heart. It’s ok to be mad at me right now, but if you will just hear me out, all I need now is a second chance to show you I have changed, let me show you I can be better, I love you, my life. I know it seemed foolish to believe in me again. I know it’s difficult to trust me again, but believe me I have changed myself completely. I have turned into a guy who is loyal and who is only yours. Please give me a chance to prove my love and care you. I really love you and I need you, my dear! You might be not expecting a text from me. You might be wondering why I have contacted you at this time. And the reason is simple. That’s because, I am very sorry for what I did and I am just unable to live without you. I know forgiving me is very difficult, but still, I request you for a second chance. Please! I know forgiving me is extremely difficult. I know patching up might not be the thing from your side. Still, I just want you to keep your hand on your heart and think about the happiest and lovely days we have spent together. If there is still something in your memories, then please give me a second chance to prove myself a better person forever. Love you! Once you believed in me and we were a perfect couple. Once I was the best part of your life and we were happily living. I am sorry for all the mess I created and we broke up. Can you please give me a second life? Can you please give me a second chance? I promise I will be the same as your choice. Thank you for giving me a second chance. It is all nobility and kindness. Thank you once again. I am a quick learner. In just a few days, I have learnt that living without you is an impossible thing for me. You are the light of my life and without you, I will be completely lost. Please give me a second chance and I will shower all of my love upon you. It’s a humble request and I hope you will accept that.